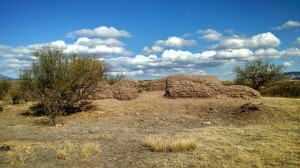 The Guevavi mission was a major focus of Spanish conversion efforts among the indigenous Sobaipuri-O'odham people in Arizona. Project Director and JRI Research Associate Deni Seymour thinks they have identified the 1751 Jesuit mission among six adobe structures that surround the recognized NPS mission. Her project hopes to date each with adobe wall samples using the luminescence technique. This will inform on which of these adobe structures date to (a) the Kino period (1691-1711), (b) 1751, and (c) which are Franciscan or later mining/ranching features. For years historians have suggested that the standing ruins (now on National Park Service land) are the remains of the mission originally built in 1751. The artifacts found with this new building are consistent with this alternate structure being from the Jesuit period. It lacks artifacts from later in the era as well. The north-south orientation also suggests it is a church, as this is consistent with standard European mission building practices. This suggests that European missionaries started standardizing religious architecture at about mid century (1751), as they committed greater resources to the conversion of the area’s indigenous residents. Guevavi was a head mission at this time, with the better known missions of Tumacacori and San Xavier within its jurisdiction. The O'odham are the direct descendants of the people who lived at the mission. Most of what scholars know of their ancestors comes from Spanish documentary records written at the time. But now, Deni is breaking new ground on this significant site with an archaeological approach. Studies of settlement patterns and site density have yielded new interpretations on the size, complexity and length of occupation at the mission site.